This baked lemon chicken is coated in a butter and herb sauce, then roasted to perfection. A super easy dinner option that even the pickiest eaters will enjoy! Chicken breasts baked in the oven can sometimes come out dry, but this recipe will never let you down! 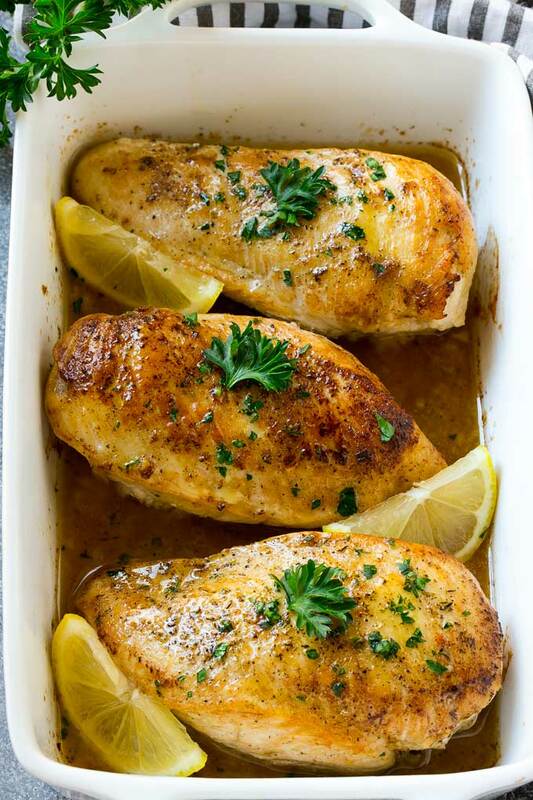 These baked lemon chicken breasts come out juicy and delicious every time, and the delicious sauce will have you licking your plate. Sometimes I just need a quick and easy protein option to get dinner on the table in a hurry! I love the convenience of baked chicken, but I find that sometimes the end result can be disappointing with bland, rubbery chicken. 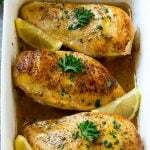 This baked lemon chicken comes out perfectly delicious every time, and my whole family adores it! For this recipe, you’ll need boneless skinless chicken breasts. I brown the breasts before I put them in the oven, it takes a few extra minutes but I feel like the added flavor is so worth it. After the chicken is golden brown and crispy, it goes into a baking dish with some lemon juice, butter, garlic, herbs and chicken broth. If you have an oven proof skillet, you can simply brown the chicken breasts, pour the sauce over the top and bake directly in the skillet instead of transferring the chicken to a baking dish. What I love about this recipe is that it’s so easy to bake as few or as many chicken breasts as you need. 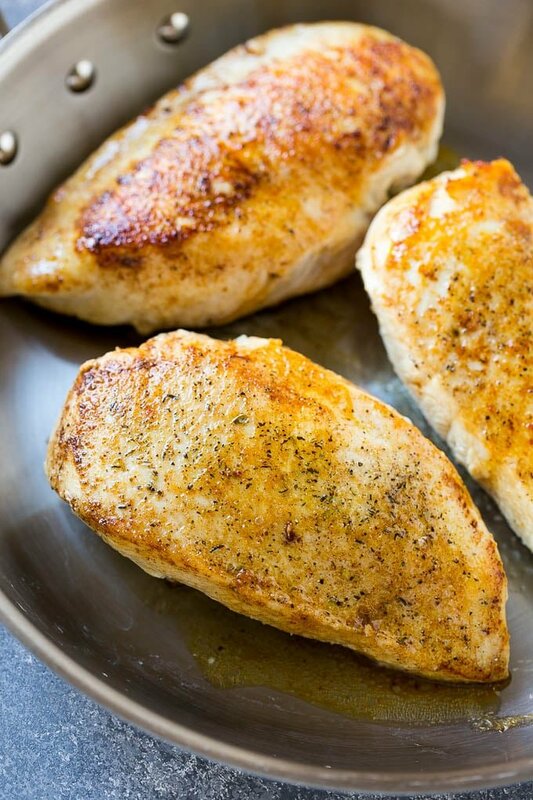 You can bake 2 or 20 chicken breasts, same process! The final step is to add a little chopped fresh parsley and lemon slices. This baked lemon chicken is best served over rice, mashed potatoes or pasta. Be sure to spoon all that extra sauce at the bottom of the baking dish over the chicken when you serve it; the sauce is the best part! I often make extra chicken to chop up and use in other recipes during the week. It’s a great basic chicken that works in so many dishes like casseroles, soups and pasta. Preheat the oven to 400 degrees. Season the chicken breasts on both sides with salt, pepper and the Italian seasoning. Heat the olive oil in a large pan over medium high heat. Add the chicken breasts and cook for 3-5 minutes on each side or until browned. Transfer the chicken to a baking dish. In a small bowl, mix together the butter, garlic, chicken broth and lemon juice. Pour the butter mixture over the chicken. Bake for 25 minutes or until chicken is cooked through. Bake time may vary depending on the thickness of your chicken breasts. Spoon the sauce on the bottom of the baking dish over the chicken, then sprinkle with parsley and serve. Garnish with lemon slices if desired. 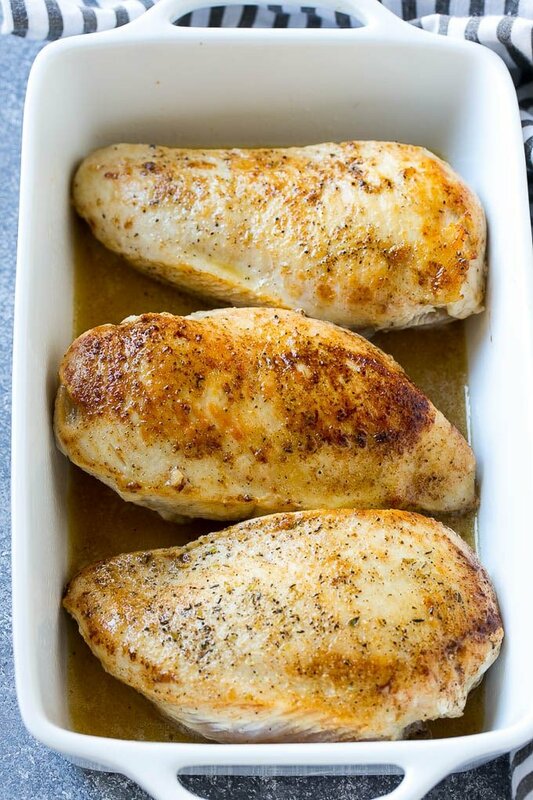 When I make this recipe I use chicken breasts that are about 1 inch thick. If you use thinner chicken breasts, be sure to decrease the bake time accordingly. My cooking experience is very limited. It was easy to make and delicious. I’m so glad this came up in my search! It is absolutely delicious & easy!! The sauce is great spooned over veggie sides, too. Thank you!!! You can make the sauce ahead of time, but I wouldn’t sear the chicken in advance as it will still be raw in the middle and I’d be concerned about storing partially cooked chicken for food safety. 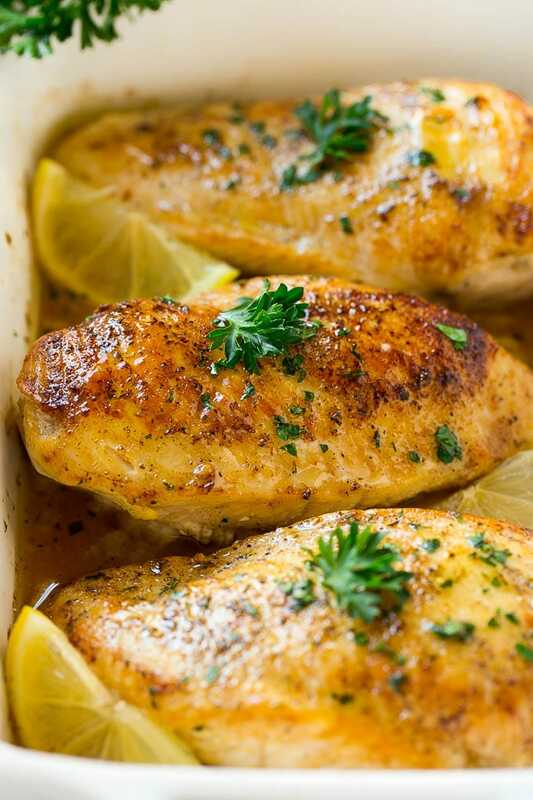 Will this baked lemon chicken recipe pair well with a baked potato as a side? That would be a great side dish! Tried this tonight. It was excellent. I used a packet of dry Italian dressing instead of herbs and after browning breasts, quickly threw wet ingredients in pan, stirred up brown bits and poured on the chicken. Moist and flavorful! How about adding capers?? Thoughts ? That would be a great addition! I’m always a little nervous about using chicken breasts with company, as I think it might be a bit dry. Can I use thighs or legs, and how would I adjust the recipe. I’ll be cooking for six. Thanks. Yes that’s fine. I assume you’re referring to bone-in skin-on cuts? I’d say bake for 35-40 minutes in that case. What can I use if I don’t have Italian seasoning? You can use a blend of dried basil, oregano, parsley and garlic powder. If you don’t have all those spices, you could also try dried thyme! Wonderfully tender and delicious! I love how easy this recipe is and the flavors are wonderful! Thanks so much!!! Made this dish last night. Absolutely delicious! Can’t wait to make it again, shared the recipe with my girls! Glad to hear everyone enjoyed it, thanks for reporting back! I was looking for a good, simple chicken recipe that didn’t require a lot of ingredients, so I gave this a try. My husband and I loved it! I couldn’t believe how good it was, with so few ingredients. The Italian seasoning and the glaze ingredients really give it a delicious flavor! I’m even thinking of preparing it for company, it’s so quick, easy and deliciious! Being old school and preparing more chicken than the recipe called for, I just approximated the ingredients, rather than measuring them out, and it turned out perfectly. I hope it’s that good when I make it for company! So happy to hear you enjoyed it, thank you for reporting back! I tried this recipe and it’s fantastic. The second time, I wrapped the chicken in bacon because I had some I needed to use, and that was amazing!! Love the idea of using bacon, thanks for reporting back! I tried this a little while ago and loved it. I’m currently doing the Whole30 diet, think it’s ok to use Ghee instead of butter? Same amount, any other changes then? Thanks! Yes that should work just fine! Just made this. To my surprise extremely tasty but low in calories and high in protein which is what I need. Going to use a bit less bitter, no garlic and more lemon juice and put over rice. Delicious! Yay so glad to hear you enjoyed it! Thanks for reporting back! This recipe was absolutely delicious! I made this for my family and everyone ate it. My husband wants me to add this recipe to our favorite meals to cook. Yay so happy to hear that! Thanks for reporting back! Made this tonight using my cast iron Dutch oven. I made additional sauce and added in the last 10 minutes so I would have extra for the rice I made. I never finish a chicken breast in one sitting, but I did tonight. Flavorful, moist, easy, and delicious. Checked all the boxes. It’s a keeper. Thanks! Could not find removal of email address from your site. Please remove. Thank you. You need to go to the site and click the bell icon in the lower right hand corner to unsubscribe. So is this recipe, as it is written, just based on using 1 chicken breast? And if I make say 4, I would change the recipe accordingly? That seems like it would be a lot of butter. It uses 1 1/4 lbs chicken breasts which is 3 large breasts or 4 smaller breasts. Thanks! Can’t wait to try it. GREAT and easy/fast recipe..I’ve made this recipe at least 8x since finding it. I’ts a family favorite.. So glad to hear your family enjoys it, thanks for reporting back! Made this recipe exactly, served with rice pilaf and green beans. so easy and everyone loved it. Happy to hear you enjoyed it, thanks for reporting back! Sounds fabulous, I’ll try it that way next time!